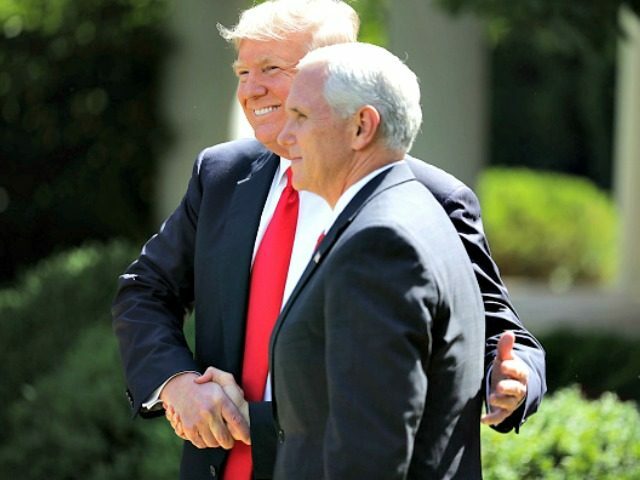 1 Jul 2017 Washington, D.C.
WASHINGTON, D.C. — In exclusive comments to Breitbart News on Saturday, the Press Secretary for the Vice President, Marc Lotter, pushed back against claims from six Republican “sources” that there is division between the Trump and Pence teams. Lotter said the story line that the White House is in turmoil or that the Trump and Pence teams are divided is “the gold standard for fake news.” He refuted outsiders’ claims that there is any sort of division between staff members of the President and Vice President. None of the six Republicans cited in a Saturday McClatchy DC article entitled “GOP’s latest worry: White House turmoil dividing Trump, Pence staffs,” were identified as having ever worked for the Trump Administration. The report states that four of six sources used had worked merely for the Trump-Pence campaign or transition. Two named sources have worked for establishment Republicans who favored Jeb Bush for President in 2016. Michael Steel worked for Bush’s 2016 campaign directly. Lotter told Breitbart News that what it comes down to is, “This is an entire story based off of speculation from people outside that have no idea what it’s like being in there.” The Trump and Pence teams are working in collaboration and communicating, according to Lotter. “Our staffs are very close and we’re continuing to get closer every day,” he added. He confirmed that the two teams are working together to move the President’s agenda forward. Former Jeb Bush for President Senior Advisor Michael Steel told McClatchy, “The administration doesn’t know who to trust” and “When you’re under attack the circle tightens.” Steel also previously worked as Press Secretary for ousted House Speaker John Boehner. Boehner resigned from his position as Speaker of the House and left Congress altogether in 2015 after heavy calls for his ouster. Former Republican Leader Eric Cantor was primaried by Dave Brat in 2014. Jeb! Bush’s 2016 presidential campaign failed to pick up steam and he left the race after poor results in the New Hampshire, Iowa, and South Carolina, despite having raised in excess of $150 million for the campaign. The article goes on to cite staff out of the White House and with the Vice President’s office that say there aren’t problems between the two teams, and those making claims of problems don’t work inside the Administration. McClatchy cited another unnamed “former adviser” professing to be in contact with Trump and Pence staff, who claimed that two mid-level Pence staffers “appeared delighted” that former FBI Director James Comey and Attorney General Jeff Sessions were testifying back-to-back before Congress. Another source cited didn’t actually claim tensions, but “if” they existed, it was likely related to “rumors” and “jockeying going on.” The article goes on to speak of a glowing relationship between Trump and Pence themselves. “Our staffs have never been closer,” attested Lotter, who referred to communications, scheduling, top level staff of both the White House and Vice President’s office who meet multiple times a day. “The staffs are getting closer if anything,” he said. Lotter said his days typically begin and end meeting with White House Press Secretary Sean Spicer and Principal Deputy Press Secretary Sarah Sanders.